Hey...it's almost that time of year...the excitement of a new school year is upon us...many of us have teacher effectiveness goals...others are reflective of the direction you want to head when new kiddos come through you door. Last year, I was on the teacher effectiveness rotation. After 23 years of teaching...I had many artifacts that deemed me a proficient teacher, but then again I am not always reflective on paper. It got me thinking...what are my beliefs as a science teacher. I have looked at it through the lens of a classroom teacher up until now...but now I want to take a different approach. It took me a while to really figure out what is important in my room now that education has changed so much. 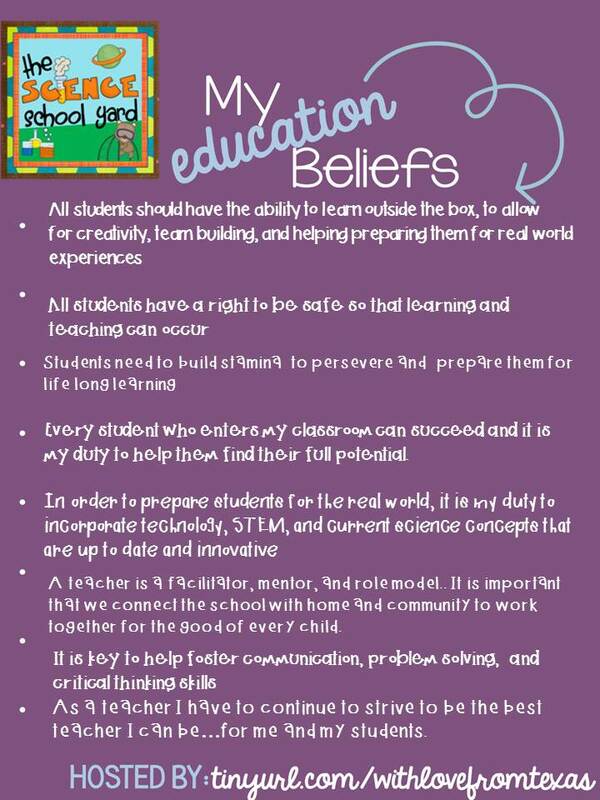 I also had to put my beliefs into perspective when it comes to me being a K-5 Science teacher. What about you? Do you have beliefs that you establish and reflect on before the new school year? Have you ever written them down? This is a first for me. It helps me have a purpose and it will drive me to action. I encourage you to write your beliefs down and strive to live by them. Continue on with the Beliefs to Actions blog hop by visiting my new friend Stephanie Upton over at The Marvelous Middle! Great post! I love that you believe so strongly in fostering creativity, problem solving and innovation. That really resonates with me! I get the sense that you're a fabulous science teacher and will have to check out some of your products! Thanks so much for your response! I have noticed as I teach summer engineering classes that kids don't have stamina to be creative and problem solve. I find that after having the same students for over 3 years now, my own students do...I think we are doing something right! Your belief in perseverance resonated with me 100%. That, too, is on my list of teaching beliefs. So many kids have been "trained" to give up and not work hard for something. I think it's important to show them that good things come to those who work incredibly hard. I just love your belief that kids should have the ability to learn outside the box. I just love how creative that is. No one wants a cookie-cutter education. Fabulous job and fabulous beliefs. Your beliefs are a great read! I really enjoyed your post!